If you’re looking for a sleek resume design that still hits on all the traditional information, then the Modern Resume Template is the right tool for you. 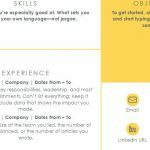 This free resume template has everything you need to quickly and easily change the examples to fit your professional needs. 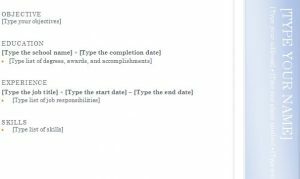 The simple Word document will show you what you need to enter to fill out the resume template. 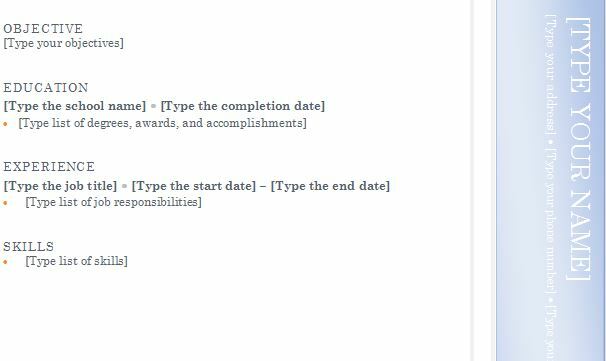 In a matter of minutes, you can have a completed resume that looks professional, modern, and easy to read. You will simply go through the bracketed examples and replace all the information given, pretty simple right? If you’re ready to get started today, just follow the simple guide below. To download the free template file to your computer, just click the link we have given you at the bottom of this page. To the side of the page, you will enter your name and the contact information. Everything you type will be adjusted vertically. This simple design change makes your resume look much more impressive than traditional templates. Next, you need to compose a well-written objective to showcase what you’re looking for in the position. If you have a degree, you can enter that in the next section of the template. Why not? You did pay all that money for your diploma, might as well show it off. Now, go ahead and enter all the information for your different experiences. You can copy and paste this section as many times as you need. You will simply enter your former job title, start and end dates, and a summary of your core responsibilities. 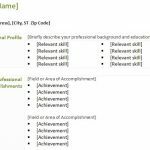 Finally, the fee Modern Resume Template gives you a space to enter your skills. This should be a short numbered list of all the skills you have, relating to the job you’re applying for. 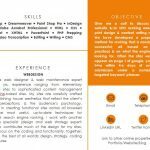 Together, all these elements give you the opportunity to create a unique resume that flows nicely. Impress your future employer with this free template, today!